Every day now seems to bring yet another "first" object created by a 3D printer. We have seen super cool and colorfully printed shoes, canoes, candies and much more. Now, DUS Architects, a Dutch design firm, is in the process of creating the world's first 3D-printed building – a traditional looking Dutch house overlooking a canal in Amsterdam. 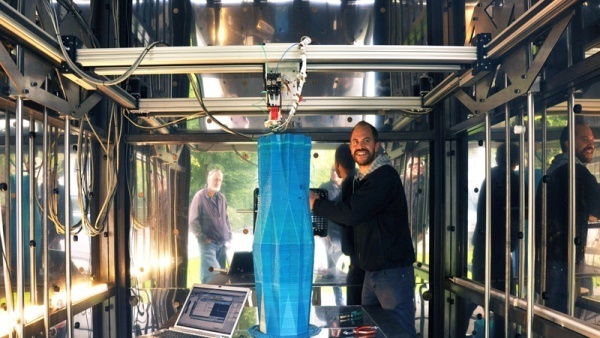 The structure, which is made of plastic, is being created room-by-room, in large block sections by a giant printer that is housed inside a shipping container. Work began at the start of this year and the house's creators believe it will take up to three years to complete. Want to see more? Construction is open to the public and curious onlookers are encouraged to stop by, if you happen to be in the neighborhood.